Dwindling workforce, regulatory issues biggest challenges facing Iowa’s home building industry. When something needs attention at the Home Builders Association of Iowa, Executive Officer Jay Iverson is the one to call. In fact, he’s the only one to call. “I’m the one and only staff member, which is somewhat challenging, but works out fairly well with our dedicated volunteers,” says Iverson, who came to the association in 2013. 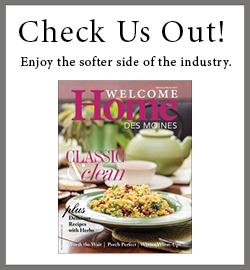 The group is composed of more than 1,800 members involved in Iowa’s home building industry. What did you do prior to working at the HBA of Iowa? I most recently was executive director at the Iowa Nurses Association. Prior to that, I owned a home remodeling company for several years, and was executive director at the Iowa Chiropractic Society in Ankeny. I was previously chief executive officer at the Cedar Rapids Area Association of Realtors for 11 years, and before that worked for chambers of commerce groups in Iowa, Missouri, and Kansas. In your opinion, what is the most significant challenge facing home builders in Iowa today? How is the association helping address it? Finding qualified workers is our industry’s biggest challenge. Growing the talent pipeline is critical to the future of our industry and the economy. We are grappling with a severe shortfall of workers, combined with one-sixth of the workforce leaving the industry in the next decade. There were 321,000 construction jobs added in 2014, and we estimate over 8 million new jobs by 2018. We need more than 2 million craft professionals by the end of next year. Supporting and expanding existing programs, combined with building public/private partnerships, is vital to exposing young people to the multiple career opportunities in the trades. For many years, there’s been a stigma attached to “working with your hands.” It’s been looked down upon by parents, academia, teachers, and counselors, who have pushed young people into the four-year degree track. We want students to know that the construction field is a great career option. For example, the average annual wage for carpenters is $45,590 and for electricians, $54,520. And you don’t need to go into debt financing your education. There are a myriad of opportunities for on-the-job training or vocational technical education, with employers oftentimes paying for those costs. We’re exploring a number of initiatives for bringing in potential construction workers. One issue is that students are no longer learning the necessary job skills in schools because programs such as woodworking have been phased out. So we’re having to start from scratch, and we’re trying to catch kids early. We’re seeing things such as the Home Builders Association of Greater Des Moines and other groups partnering with Central Campus to raise money to fund the first year of a variety of vocational classes. The Greater Iowa City Home Builders Association is offering summer camps for middle schoolers, where they’ll work on projects including building a birdhouse, and hear from individuals working in the home building industry. The second most significant hurdle is regulations. On average, the regulations imposed by government at all levels account for 25 percent of the final price of a new single-family home built for sale in this country. One major regulatory issue is in regards to topsoil. We’ve been fighting many local cities trying to enact rules requiring up to 12 inches of additional or amended topsoil on job sites, which they say will reduce flooding and produce greener grasses. The bottom line is it will not reduce flooding, and the additional costs related to trucking in soil and enforcement will only increase the prices of homes, making them less affordable. We would like for cities to stick to the federal language that Iowa adopted, which states that whatever soil is on the site, stays on the site. How is the state association using technology to draw younger people into the industry? One of our latest efforts to bolster our workforce is working with Scott Siepker, known for playing the “Iowa Nice Guy” character. He took part in a recent video called “Farmer Nice,” which humorously explains how the work farmers do impacts our lives. We want to do a similar video that highlights the construction trades and put it on social media. It’s an initiative geared toward the under-30 age group, and we hope it catches their attention. In your time with the home builders, what accomplishment are you most proud of? My decision in 2014 to move our office from a nondescript strip mall in Urbandale to the East Village, at the heart of the state capital, is something I’m proud of. This really is the hub for many associations, and we’re in a much more vibrant environment. I also think we’ve greatly improved communication within our organization, which was one of my main goals when I took this job. It helps that I have awesome executive officers at the local level who are willing to carry the message forward. Everyone is collaborating and communicating so much more effectively.